Boystown is in police beat 1924. It's the most populated and congested beat in the city. That second sentence is 100% false. 1924 is not even close to being the most populated and congested beat in the city. Heck, it's not even close to being the most populated in Wrigleyville and Boystown. 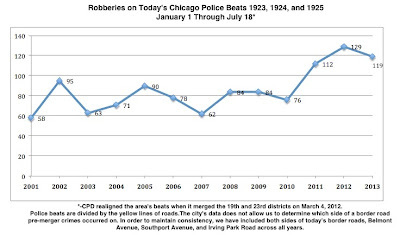 This is important because police executives have started efforts to minimize beat 1924's rankings as #1 in robberies and #3 in violent crime by saying that those rankings should be expected for such a "densely populated" area. In fact, according the U.S. Census Bureau, the beat directly next to 1924, beat 1925, has more than twice as many residents. Dear Police Department: It's Called "The Internet." Use it. 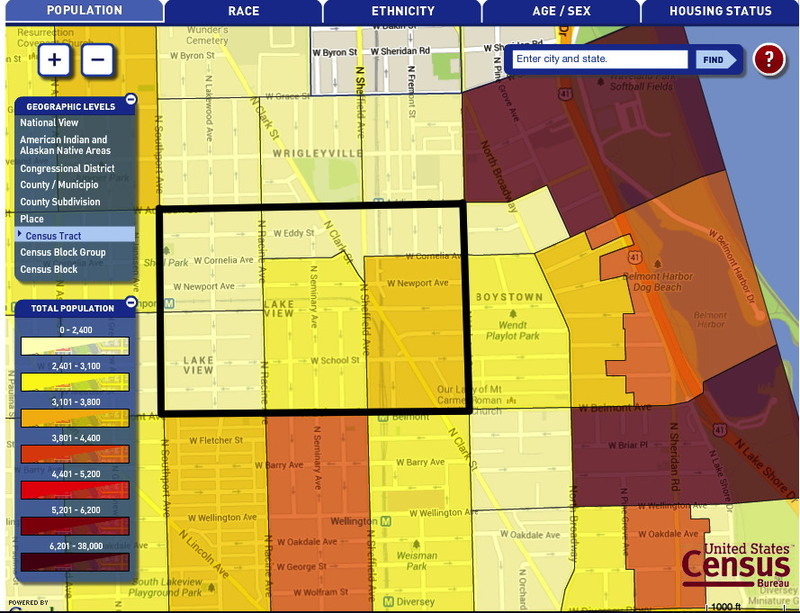 Let's dial up the US Census Bureau site and look at a color-coded map of the neighborhood. That map up there at the top of this post. Beat 1924 is outlined by the black box we've added. One glance at the map will tell you that 1924 isn't as populated as areas right next door. Hell, we didn't even have to zoom out to "discover" that someone in the police department is making things up. We're hungry and have iHop on our minds, so we won't waste time looking at the population of the skyscraper-filled 18th district. 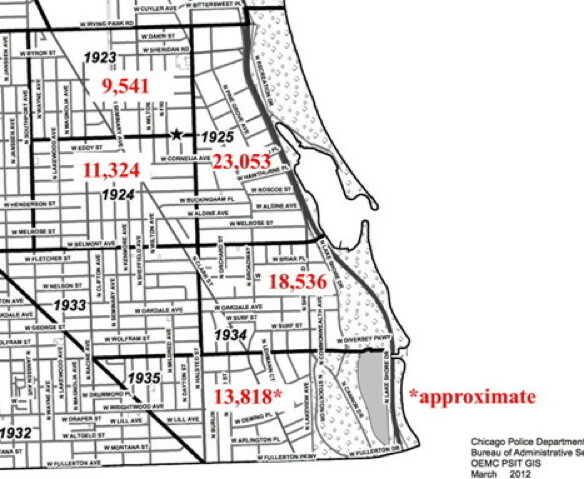 We started to add up the numbers in the Census Bureau's colorful boxes and put beat populations on a map of the 19th district, but we decided to stop after 3 of the first 4 beats we tallied exceeded 1924 in population. 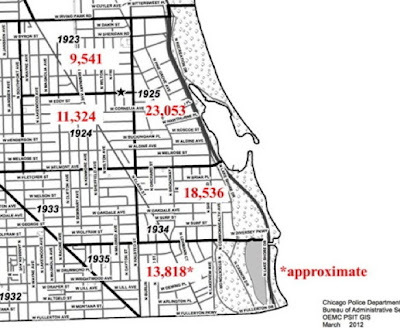 Beat 1935 has an asterisk because Lincoln Avenue split one of its census tracts and we had to spitball that section. But Town Hall Police Cmdr. Elias Voulgaris, who has been in the position just a year, said while he understands there is a concern, residents probably were not considering all factors in comparing their beat with beats in other neighborhoods. Beat 1924 is more loaded with bars and nightlife than other areas, he said. It's more populated and attracts far more visitors late at night, especially with some bars staying open until 4 a.m.
"I'm not making excuses," he said. "I'm telling you, you have to look at other factors." The "more populated" thing has been torpedoed. And we are certain that this area doesn't have more nightlife than the 18th district's River North, Michigan Avenue, Division Street, Rush Street, and Hubbard Street districts. So, phooey. The commander's right about one thing, though. He's not making excuses. He's making things up. Why are we #1 in robberies? We didn't used to be anywhere near #1. There has not been a seismic shift in our area's population. Chicago nightlife lovers haven't suddenly discovered Lake View. 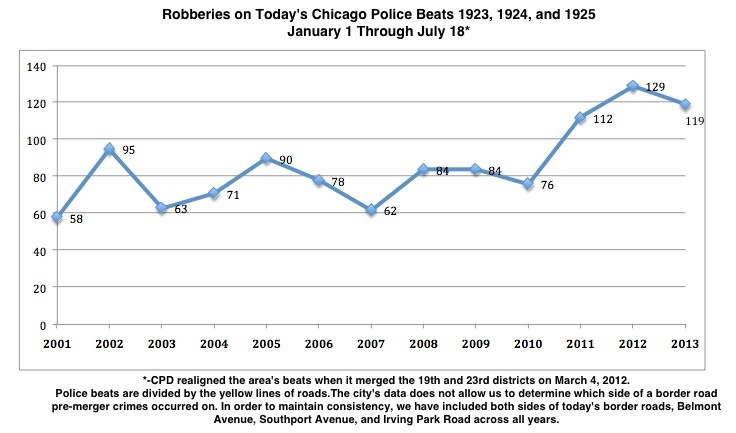 We think the reason we've become #1 in robberies is because there are a lot more robberies than there used to be. Now, the question is, will the Chicago Police Department's leadership help us solve this problem or is it going to try to lie its way into winter? Again.